Our keynote presentation will be a discussion of the lasting cultural impact of The West Wing television show. Zachary Pincus-Roth, Pop-Culture editor for the Washington Post, will moderate a panel consisting of West Wing cast members Kim Webster & Devika Parikh as well as former White House staffers David Kusnet and Gautam Raghavan. Our panel will discuss such questions as: Where does the show land in the discussion of "Peak TV"? In what ways has the show drawn people to political life? What did it mean to the people involved? What is the lasting legacy of the show? and much more. Ticket sales for catered Lunch are CLOSED, but if you would like to attend the presentation you may do so for $15 by sending an email to info@westwingweekend.com and getting details. You must have a ticket to attend. We are excited to announce that the West Wing Weekend will include a presentation featuring several of the contributors to the NEW book West Wingers: Stories from the Dream Chasers, Change Makers, and Hope Creators Inside the Obama White House edited by Gautam Raghavan. Mr. Raghavan will be joining us to discuss the book at 11:00 AM on Sunday along with Former Advisors to President Obama, and contributors, Lynn Rosenthal & Stephanie Valencia. For more details on the lives and careers, of our guests please see their full bios here. We are excited to announce that Bob Lehrman, Vice President Gore’s first chief speechwriterwill be joining us to discuss his experiences in the White House and beyond. Mr. Lehrman will be a panelist on our Featured Presentation: Real Life In the West Wing in White Oak A&B (our Main Events Room) at 11:00 AM on Saturday, September 29th. For more details on Mr. Lehrman’s life and career, please see his full bio here. We are excited to announce that Bryan Monroe, a Professor at Temple University’s Klein College of Media and Communication, will be joining us at the West Wing Weekend. Before joining Temple in 2015, Mr. Monroe served as an editor and journalist for many nation publications, including as the Washington Editor, Opinion & Commentary at CNN and the editor of CNNPolitics.com. He also served as the personal editor of “Unhinged: An Insider’s Account of the Trump White House,” the tell-all #1 New York Times Bestseller by former White House aide Omarosa Manigault Newman (published by Simon & Shuster). Mr. Monroe will be a panelist on our Featured Saturday Presentation: Real Life In the West Wing in White Oak A&B (our Main Events Room) at 11:00 AM on Saturday, September 29th. For more details on Mr. Monroe’s life and career, please see his full bio here. We are excited to announce that David Kusnet, chief speechwriter for former President Bill Clinton during the 1992 campaign and the first two years of the administration, will be joining us to discuss his experiences in the White House and beyond. Mr. Kusnet will be a panelist on our Featured Presentation: Real Life In the West Wing in White Oak A&B (our Main Events Room) at 11:00 AM on Saturday, September 29th. For more details on Mr. Kusnet’s life and career, please see his full bio here. We are so excited to announce that Beck Dorey-Stein will be joining us to discuss and sign her book, FROM THE CORNER OF THE OVAL! Ms. Dorey Stein’s program will be held in White Oak A&B (our Main Events Panel Room) at 10:00 AM on Saturday, September 29th. 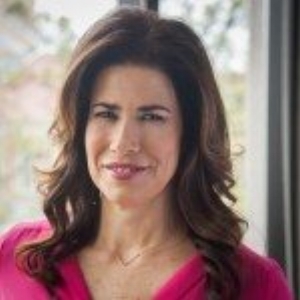 For more details on Ms. Dorey-Stein, please see her full bio here. We are excited to announce that Kim Webster, who played "Ginger" has agreed to join us as a special guest! Ms. Webster will be participating in panels and Q&A sessions and will be available for autographs and photo sessions, along with our other Bartlet White House staff guests Melissa Fitzgerald, Devika Parikh, Peter James Smith, and William Duffy. Click here to read bios of Ms. Webster and all of our other Special Guests! Please check back often for more details and for the details of the major programs that we have yet to announce! 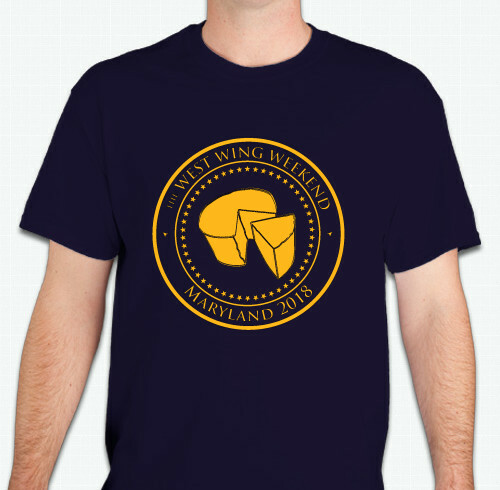 We are collecting pre-orders for the West Wing Weekend t-shirt! If you want to guarantee you get one (and ensure we have one in your size) then pre-order now and we will have it for you at registration. If you wait to buy the t-shirt on site, there will be a limited number available on site, with limited sizes, and the price will be $20. So pre-order yours now! Please book your rooms at the Marriott Bethesda North! Our room block will be available for one more month- until Septemeber 6th - and after that date our rooms will be released and you will no longer be able to use our group rate! Our contract with the hotel depends on our guests using these rooms so if you have not reserved yet, PLEASE do so before September 6th! Special Guest: Composer W.G. "Snuffy" Walden! We are extremely excited to announce that 13 time Emmy nominated composer, W.G. "Snuffy" Walden will be joining us at the West Wing Weekend to talk about his time working with the creative team of the show and to share his talents and insights on composing film and television soundtracks. Mr. Walden's indelible theme music and other contributions to the West WIng are a large part of what makes the experience of the show so all inclusive and extraordinary and we are thrilled that he will be joining us to share his thoughts with our attendees. Mr. Walden will be participating in in panels and Q&A sessions and will be available for autographs and photos sessions, along with our Bartlet White House staff guests Melissa Fitzgerald, Peter James Smith, William Duffy., and Devikah Parikh. Check back soon for our full programming schedule and for photo/autograph pricing! In the video below, our communications staffers Ben and Jerri react to the news. We are excited to welcome our fourth special guest from the West Wing, Devika Parikh, who played communications aide "Bonnie". Ms. Parikh will be participating in panels and Q&A sessions and will be available for autographs and photos sessions, along with our other Bartlet White House staff guests Melissa Fitzgerald, Peter James Smith, and William Duffy. Reminder: Submit your programming ideas by July 30th! Our Call for Proposals is still open and we want to hear from you! Do you have a topic that you’d like to hear about, a panel you’d like to lead, ideas for a paper? We are taking submissions from registered attendees so you can be a part of the experience. Submissions will only be accepted until July 30th so submit the form to get your ideas in now! You want to be in the room where it happens. Reflecting the richness and depth of The West Wing itself, the West Wing Weekend will have a variety of programming ranging from the serious to the whimsical. Think the Clinton Global Initiative meets Comic-con. You can learn about policy and how to engage in the political process, how to turn your patriotism into action and run for office. You will be among your tribe. You are welcome to dress as a press secretary, or not. We’d probably all be happy just sitting around in big pajamas, eating popcorn and watching the show with each other, but there’s so much more ahead. Discuss topics from the show with cast members and creative team members! 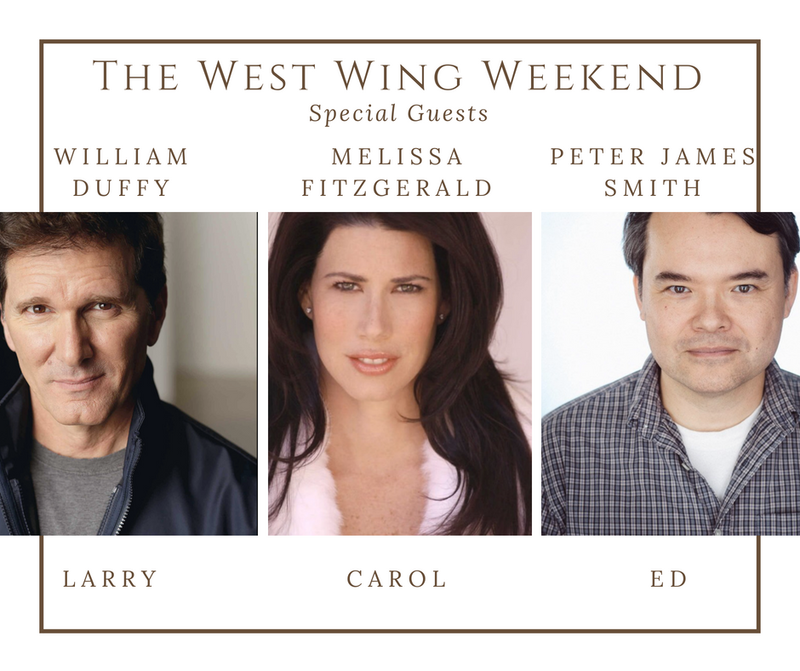 We are honored that West Wing cast members Melissa Fitzgerald, William Duffy, and Peter James Smith (and even more special guests yet to be announced!) will be in in attendance at the West Wing Weekend. They will be participating in panels discussing their time on the show, their lives and careers, and other great topics! The guests will also be participating in a Meet and Greet and in some select other programming. In addition, there will be opportunities for attendees to purchase photo ops and signings with the guests. 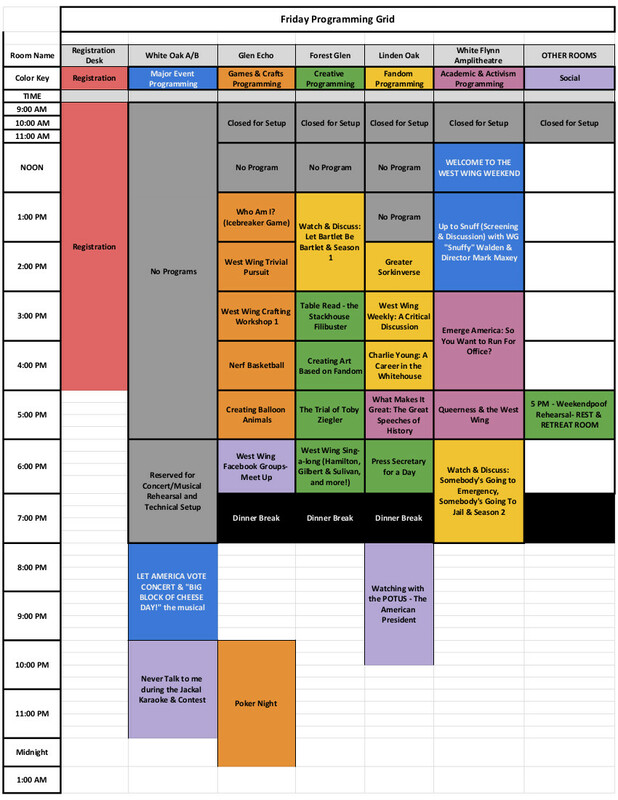 In addition, throughout the weekend there will be other special programs and creative shows created for your enjoyment by our talented cast and crew. These performances and special events themed around the West Wing will be guaranteed to get you talking! On Saturday evening we will be hosting a State Dinner (tickets to the dinner will be sold separately and will be available once we have finalized the menu!). The State Dinner will include a special performance from a talented cellist. (Just don’t expect Mr. Ma!) This will be followed immediately by our Presidential Ball. (The Ball will be open to everyone with a West Wing Weekend ticket) Come in your white tie attire (or come as you are!) and join us for an evening of music, dancing, and international intrigue. On Sunday morning, we are proud to offer a Non-Denominational, Interfaith Service: “Be Subject to One Another”. In the cold open of “War Crimes”, President Bartlet complains about some bad theology and suggests his own interpretation: “Be subject to one another.” What does it mean to live our lives in this way? Through music, meditation, and sacred texts from The West Wing and the world’s religions, as our texts as we explore what it means to be together, to feel a sense of duty to one another, to want to be the guy the other guy counts on. All are welcome! And throughout the weekend there will be lots of drinks with little umbrellas. Late night poker games. Nerf basketball. Chess matches. West Wing trivial pursuit. Gilbert & Sullivan sing alongs. Finally, and most importantly, running in multiple conference rooms from approximately 9am-5pm each day in 50 minute blocks we will present panels and discussions about the show itself and its impact on our lives. These panels and presentations will be your chance to explore the incredible depth of material in the West Wing. These varied programs will touch on academic topics, non-profit and political engagement, stories, themes and characters, from the show, the life of the fandom, and much more! Take a fond look at the online communities that sprang up to discuss, question, and analyze “The West Wing,” - where fans share their love for - and frustrations with - the series. From LemonLyman,com’s real-world inspiration, “Television Without Pity,” to the AOL, Yahoo, Facebook, and other groups. Several – but maybe not enough – times in the run of the show, LGBTQ+ issues emerge, each handled in a particular way common to the best thinking of the time. Nineteen years later, much has changed, even as much has stayed the same. Our conversation will explore how the show’s moral and religious grounding – as well as our own – might help or harm the work for acceptance and equal treatment, and how we might imagine our beloved characters growing in these ensuing decades. From Joey Lucas to President Bartlet himself, people with disabilities are shown in high powered positions dealing with the stress of important jobs. How is that reflected in real life? Dramatic readings of some of the great political or historical speeches. Examine what makes them great stylistically, what was the historical context, and why does the speech linger? Despite so much to commend a modern viewing, there are many ‘ouch’ moments when it comes to the treatment of women and discussions of sexual harassment. Our conversation will explore the show’s moral and religious grounding around issues of misogyny and sexism, and how we might imagine the show’s attention to #MeToo in a contemporary setting. Hear inspirational stories of political engagement and public service inspired by our favorite show and bring your own West Wing origin stories to share and discuss. Find out what it’s really like to work with legislators to make the laws. Hear from interns, campaign staffers, and candidates. Fans of the West Wing appreciate good writing, civic engagement, and the intricacies of policy making. Learn from people who have walked the walk what life is like in the “Real” West Wing. How has the West Wing influenced younger people? Has it inspired activism and civic engagement? From Rock the Vote to the students of Marjory Stoneman Douglas, how are younger people changing the world? Submit your ideas in our Call for Proposals! We want to hear from you! Do you have a topic that you’d like to hear about, a panel you’d like to lead, ideas for a paper? We are taking submissions from registered attendees so you can be a part of the experience. Click here to submit your ideas! Submissions will only be accepted until July 30th so get your forms in now! Our Kickstarter event was incredibly successful, exceeding our fundraising goal by 215%! Early bird pricing has ended, but tickets are still available. Don't miss your chance to attend the Inaugural West Wing Weekend! Melissa Fitzgerald, Senior Director, NADCP, who played Carol, CJ's assistant on The West Wing, will be attending the event! Learn more about Melissa! The West Wing Weekend is an intimate West Wing themed event to be held Friday. September 28th- Sunday, September 30th 2018.